Children will love these colourful mini burgers, which are made with red and yellow peppers for extra flavour and texture. Light the barbecue or preheat the grill to high. Place the ground beef in a bowl and stir in the chopped peppers, salad onions and Worcestershire sauce. Season and mix well to combine. Divide the mixture into 8 and shape into small burgers. Cook the burgers on the barbecue for 10-15 minutes, turning once, or under the grill for 5-7 minutes on each side until the burgers are cooked through and there is no pink meat. Warm the pittas on the barbecue or under the grill, then make a slit along one side and open up to form a pocket. Stuff with lettuce and chopped cherry tomatoes, then add a burger. Serve straight away, with tomato ketchup. Make with pork, lamb or turkey mince as an alternative. Serve a maximum of 2 burgers per child. Our children's recipe cards provide 50 per cent or less of the Guideline Daily Amount (GDA) of calories, fat, saturated fat, salt and sugar for children aged 5-10 years. 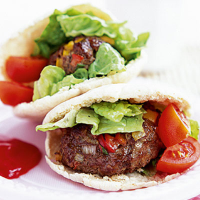 To Follow: These scrumptious mini burgers deserve to be followed by a treat of Waitrose Freshly Squeezed Orange Juice Lollies. Children will love their zesty, fruity flavour. This recipe was first published in May 2008.